Dr Steven M. Radbill, V.M.D., has been working as a veterinarian in the Philadelphia area since he graduated from the University of Pennsylvania in 1975, and is loved by his clients and his patients alike. He has been at Radbill Animal Hospital since 1980. "Questions and answers Dog Owners Ask Their Vet". Currently he is owned by two "house cats", which live at the hospital, and are named Hairy Potter and Kramer. 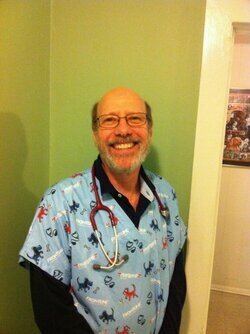 In his spare time, Dr. Radbill can be found bicycling, kayaking, gardening, and entertaining his grand kids !